STAR TREK At 50: The City On The Edge Of Forever | Warped Factor - Words in the Key of Geek. To celebrate the 50th Anniversary, every week throughout 2016 we are looking back at a Star Trek episode picked by one of our team or by a guest contributor. Today Chris Meaby travels back in time to The City on the Edge of Forever. The City on the Edge of Forever is a fascinating, unpredictable episode of Star Trek, and one that once viewed will always be remembered. It's no surprise that so many fans cite it as their favourite from The Original Series' run. 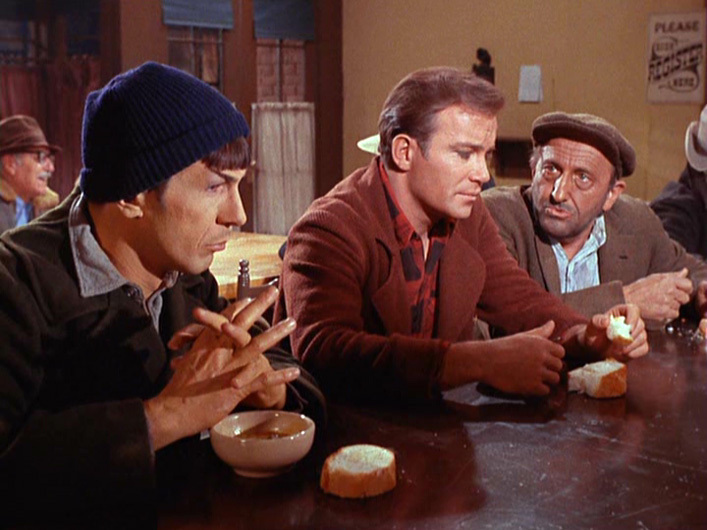 From the sheer imagination of the time travel storyline, to the genuinely funny dialog from Kirk and Spock as they attempt to fit in to the world of depression era New York City, to the tragic ending, this is just simply a great hour of television. A large part of the success of this episode lies within the cast, as both the regular and guest stars excel in their respective roles. William Shatner's acting is superb, showing us sides of Captain James Kirk seldom even hinted at, with a vulnerability and sensitivity that make his doomed love for Edith Keeler extremely moving. Joan Collins as Keeler is simply radiant, it's a very different role from her usual bad girl image but one she fully embraces. No wonder Kirk fell in love with her, as even the unemotional Spock could understand the powerful effect she had on his captain. Leonard Nimoy gives one of his finest performances as Mr. Spock, mixing dry humor with a real compassion and a depth of character that are amazing. We get to know both Kirk and Spock in a deeper way than in most other episodes, with a touching emphasis on their friendship. 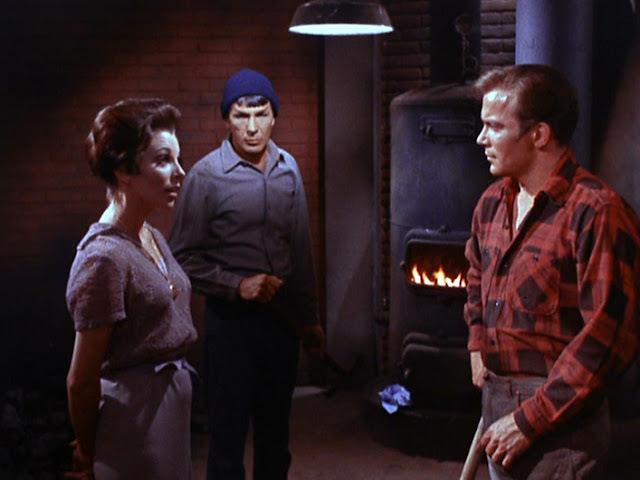 Edith comments on their obviously strong bond and tells Spock that she can see that Spock's place is by Kirk's side, as if he had always been there. DeForest Kelley remains offstage for much of The City on the Edge of Forever, yet he is the focal point of everything that's happening. 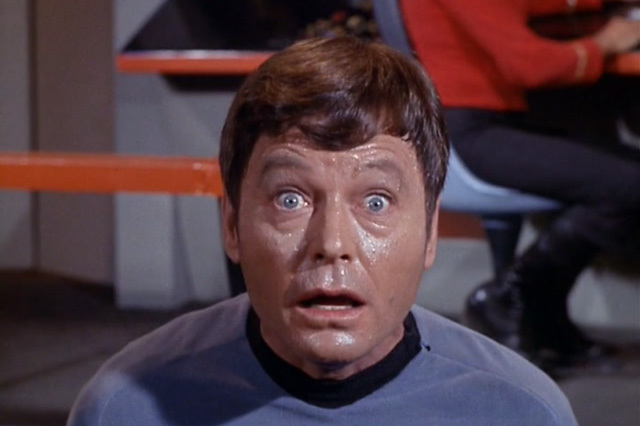 Kelley does a terrific job portraying Doctor McCoy's paranoia and even grief because of the disorienting effects of his drug induced temporary insanity. One brief moment in his confrontation with the frightened homeless man is especially memorable. When McCoy dimly begins to recognise that his surroundings look familiar from historical photos, he smiles and looks happy and briefly excited, muttering that he'd love to see the hospital of this time period. Seconds later, he collapses into an overwhelming sadness at the thought of the primitive surgical methods used by Twentieth Century medicine, and weeps helplessly as the derelict looks on in a mix of fear and concern. Director Joseph Pevney must also be congratulated for his work on this episode, he set out to intentionally shoot the story in the style of a movie rather than a TV episode, and that shows, and it really does work. Kudos also to composer Fred Steiner who helps elevate this story even higher with some of the series' best ever music. Steiner weaves the theme of Good Night, Sweetheart into various portions of the episode to great effect, even in a minor key in the final segment, adding additional heartbreak to the visuals. The final part of the success formula behind The City on the Edge of Forever, and possibly the most important element, is the brilliant story by Harlan Ellison. The ideas, the characters, and the dialog which is all so beautifully performed by the actors all began in the mind and imagination of Ellison, and even though he wasn't happy with the changes made in his script by DC Fontana, on Gene Roddenberry's orders, it's still one of the finest pieces of science fiction ever written for television. 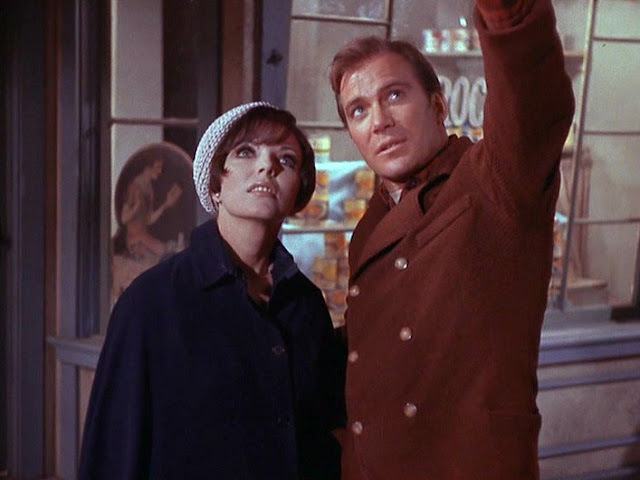 City on the Edge of Forever has long been considered one of, if not the finest Star Trek episode ever made, everyone connected with the production of this should be mighty proud to have been a part of such a fine achievement. They produced an episode which remains remarkably strong nearly 50 years after it's debut broadcast. Each time I view it I am more impressed with the quality of the story telling and the acting. The ending is simply devastating as you utterly believe in Kirk's pain and loss, and Spock's seemingly detached but totally understanding and compassionate attitude. Once viewed, always remembered, and always worthy of another viewing, even though it is always hard to watch the overwhelmingly sad ending. The City on the Edge of Forever is Star Trek at its finest, and possibly The Original Series' defining moment. It's my favourite episode of Star Trek and I know I'm not alone in admitting to that.